Taiwan Commate Computer Inc.(COMMELL), announced its new USB 3.0 Super-Speed PCI Express mini card -- MPX-7202, the Super-Speed USB 3.0 is the next revolution in I/O interconnect standards that will works up to 5 Gbps data transfer when connecting to USB 3.0 compliant peripherals, with 10 times faster throughput than USB 2.0 standard, and maintaining compatibility with existing USB 2.0 or USB 1.1 peripheral devices. The board based on the NEC μPD720200 Universal Serial Bus 3.0 host controller(The first USB 3.0 controller chip), which complies with Universal Serial Bus 3.0 Specification, and Intel`s eXtensible Host Controller Interface(xHCI), It supports Low-speed(1.5Mbps)/ Full-speed(12Mbps)/ High-speed(480Mbps)/ Super-speed(5Gbps) data rate, and supports all USB compliant data transfer type. 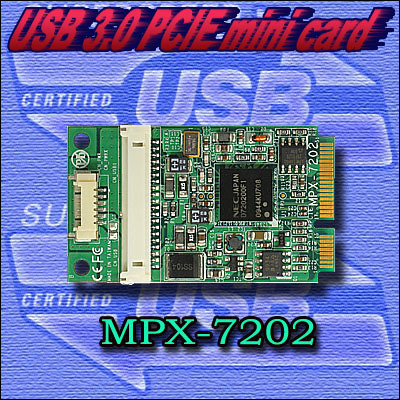 The MPX-7202 PCI Express mini card supports dual-port Super-speed USB 3.0, with its high speeds, Plug-n-Play, and more power output (maximum 900mA) to USB device that will bebefit computer peripherals in many of the applications such as Human-Interface devices, new Mass Storage Device, digital cameras, networking, video devices. PCI Express Mini Card compliant, Complies with RoHS. Onboard PCI Express NEC μPD720200 USB 3.0 Host controller. Compliant with USB 3.0 Spec. Revision 1.0 and xHCI Spec. Revision 0.96. Expands two external USB 3.0 Super-speed ports. Built-in power connector for receiving extra power supply from system. Each USB port supplies maximum +5V/ 900mA power ouput with fuse over current protection. Driver supports for Windows XP, Vista and 7 operation system. MPX-574D(D2): 1 x Giga LAN(2 x Giga LAN). MPX-SDVOX: 24 bit dual channel LVDS. MPX-7767: 802.11 b/g/n wireless LAN. MPX-2503: 802.11 b/g wireless LAN. COMMELL is a leading supplier of Single Board Computers and focuses on developing the most advanced and reliable IPC products. In addition to promise our customers constantly stay ahead of this competitive business, we are always in search of disruptive & incremental sustaining innovation. We treat every of our customer as partner and provide the best services and total support. The combination of innovation, superior quality, and excellent services will ensure both Taiwan Commate Computer Inc., and our customers always have the competitive edge in the computer world.